The fact that diagnostics manufacturers are eyeing the BRIC nations of Brazil, Russia, India, and China is not surprising. For at least 15 years, IVD manufacturers have been looking to non-OECD country markets as a source of new growth. As the governments in developing countries increase their healthcare infrastructure to rural communities, there is expected to be a significant enlargement of the market for diagnostics. These diagnostics would cover many of the primary-care segments related to diabetes, anemia, hypertension, infectious diseases, sexually transmissible diseases, and cancer screens. The major targets are India and China, mainly because these countries have the largest population base and also have the fastest growing economies. Most economists agree that by 2030 to 2060 China will become the biggest economy in the world. The same consensus does not apply to the other three members of BRIC. The BRIC countries are all very different. Even looking at economic strength, there are few similarities. Russia has a huge oil base, Brazil is known for its agricultural commodities, China has a big manufacturing base, and India relies on its evolving service sector. In the area of clinical diagnostics, BRIC nations have even less in common. It stands to reason that governments that have a history of paying for healthcare will continue to do so. In this respect the two BRIC engines, China and India, are sorely lacking. They are significantly outmatched by Brazil and a number of other emerging markets that may prove to be very lucrative from this standpoint. Over the past few years Brazil has invested heavily in infrastructure, including healthcare service; India and China still have a considerable amount of work to do to catch up. In 2009, the China Ministry of Health estimated that there were approximately 1.5 doctors per 1,000 people and that this has not changed since 2002. Similarly, there were approximately 2.2 hospital beds per 1,000 people in 2002 and some 2.8 beds in 2009. This means that the ability to build the IVD industry is somewhat precarious. True, most primary healthcare in developing countries is provided by nurse practitioners, however even they are in short supply. Growth economics aside, from the perspective of the medical and healthcare industries, economic growth does not always translate to increased healthcare spending. 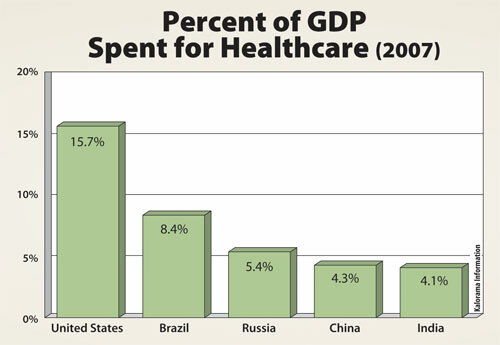 At this time, BRIC countries have little in common, except that none of them spends very much on diagnostics. It will take quite a bit of spending to come close to even the lowest OECD spender, which is Mexico at $1.6 per person. The BRIC IVD market is expected to grow from $2.9 billion in 2009 to $5 billion in 2014 at a CAGR of 12%. That’s impressive, but even though this annual growth rate is considerably more than that of the whole IVD market (6%), BRIC countries will still account for not more than 9% of the market in 2014. Currently, the BRIC IVD market is dominated by established players such as Roche, Abbott, Siemens, Beckman Coulter, and Becton Dickinson. However, domestic players such as Transasia, JMitra, Horiba, Kehua, Mindray, and others have taken the distribution of IVD products from urban areas to the rural areas in their respective markets. In addition several smaller IVD companies such as Cepheid, Axis-Shield, Biomagnetics, ChemBio Diagnostics, BionimeUSA, EuroIMMUN, DiaSorin, Abaxis, Alere, BioHit, Acon Laboratories, DiaSys, and others have made a significant mark in the BRIC countries and other developing areas. In all cases, BRIC nations are seizing the opportunity provided by increasing economic strength to invest in the health of their populations. The end game is a healthy population that can work and contribute to the economic success of the country. This will provide opportunities to those IVD companies that have realistic market strategies that take into account the challenges of marketing in new territories. Shara Rosen (srosen@kaloramainformation.com) is the lead diagnostic analyst for Kalorama Information and is author of Emerging Markets for In Vitro Diagnostics in Brazil, Russia, India, China, and other nations.